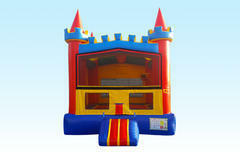 This is our 2n1 Open modular bounce house rental. It is called an Open modular because without a banner added the top portion is open netting that allows more flow of air and visibility of the kids while they jump. This unit features a spacious bounce area, a safety ramp in the entryway, and a basketball hoop. This bounce house rental will accomodate up to 10 kids. Ages 2 all the way up to 13 years old can jump and have fun inside this bounce house rental. The set up area is 17x17. If you are renting at a park you will need a generator to power the blower. If you are Renting at your home we can just plug the blower into your outlet, but it must be located within 50-75 ft from where you want the unit set up. 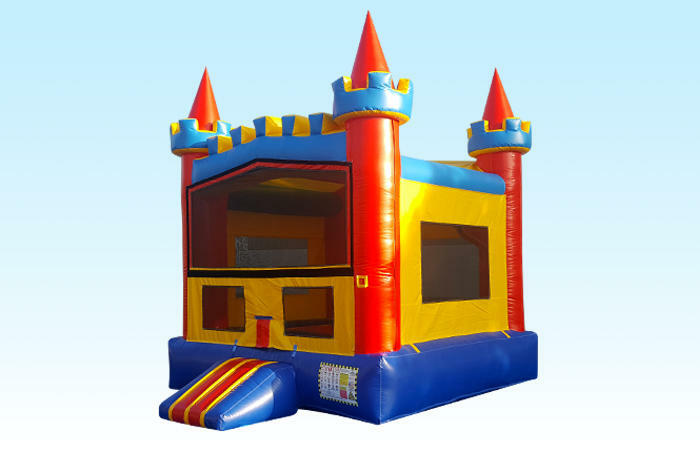 You will need one outlet 110 located within 75 ft of your set up area for this bounce house.